Through computed tomography (CT) images of the heart and other types of imaging, build-up of dangerous coronary plaques which restrict the flow of blood to the heart can be detected, even before a person develops symptoms of heart disease. Because of this, there is increasing interest in using these imaging techniques to screen for heart disease. According to a review published in JACC: Cardiovascular Imaging, a simple CT imaging technique called a coronary artery calcium (CAC) scan often referred to as a “calcium scan” may be particularly useful when screening for coronary artery disease. People are screened for many types of diseases, such as breast, colon and lung cancer, even when no symptoms are present. However, there is currently no consensus among physician groups regarding when to use cardiac imaging to screen for heart disease even though heart disease is the leading cause of death in the U.S. Instead, a patient is typically assessed using a combination of historical data and a standard blood test to measure serum lipids and blood glucose levels to arrive at a risk score to help determine if they will have heart disease in the future. While these risk scores have been proven to be somewhat useful, increasing data indicates that a CAC scan is far more accurate for this purpose. Coronary calcium builds up at the site of coronary plaque, so a CAC scan can be effective in detecting even minute amounts of CAC. The scan results are then recorded using a “CAC score,” which represents the total amount of CAC in the coronary arteries. The higher the CAC score, the greater the risk for future heart disease. 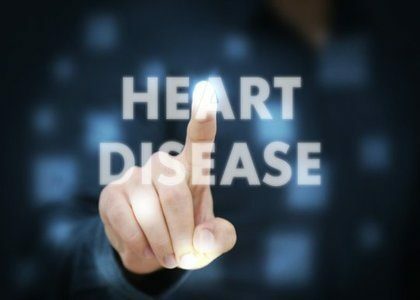 Research has shown that in approximately 40-60 percent of cases, the first time heart disease is discovered is when a heart attack or death occurs. To help understand the best type and methods of imaging to use for screening to prevent cardiac disease and learn more about the clinical outcomes related to screening, the researchers evaluated five clinical trials with 4,615 participants who were not showing signs of heart disease: one trial involved cardiac stress imaging, three involving CAC scanning and one involved non-invasive coronary CT angiography. Collectively, the trials showed an important hurdle: because modern therapies have markedly reduced the frequencies for developing the most serious consequences of heart disease, such as heart attacks and sudden death, it may be difficult to prove that the use of imaging techniques reduce cardiac death, per se, in clinical trials. Instead, investigators may be increasingly interested to determine if CAC scanning and other screening techniques can improve the overall cardiac risk profile of patients without increasing medical costs. In one of the trials that were reviewed, the EISNER trial, the use of CAC scanning was shown to improve cardiac risk profiles without increasing overall medical costs, but more studies in this area are needed.